Out with dull-looking, lacklustre hair. In with a shampoo for shine and radiance. For hair that's made dull-looking by city pollution and environmental factors, this glossing shampoo is ideal. Plum-kadu fruit from the Australian rainforest has potent detoxifying properties while light reflectors and amino acids help to make your hair more healthy looking. And true to form, it smells great too. Massage into wet hair, then rinse and repeat (if needed). Follow with Plum-kadu Glossing Conditioner. I have long, fine, coloured hair, which likes a little tlc. This shampoo provides it, along with the conditioner. My hair just looks really healthy and glossy after using them, and I like the fresh scent. The price means I won't be using it everyday, but I will definitely be buying it in future. Left my hair fantastically soft, clean and shiny. Pleasant, clean fresh scent. 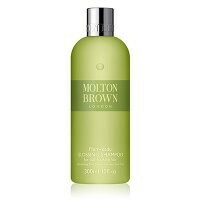 A light delicate fragrance that left my hair feeling nourished and looking glossy, instead of its usual dull sheen. Normally I wash my hair every day if I want it to look well cared for, with this shampoo, I did not need to. It lathers well but not excessively and leaves my hair squeaky clean after one wash. I used it along with the complimentary plum conditioner and my hair felt and looked better than it had in years. In my opinion it is probably worth the salon price and a little goes a long way, so the bottle will last me for ages. I would most definitely recommend. I could not believe the results achieved just by using this product. It was as though I had been to the hair salon to have my hair done. I enjoyed using this product, but it would be as a treat for my hair, as its not in the everyday usage price. It lovely to work with, its gentle and very clean smelling due to the sandalwood tones. (very unisex). It's presented as a detoxifying shampoo and it certainly achieve its claim. The wonderful after feel, lets you know and smell that you hair has had beautiful treat. I used it along with Plum-kadu Glossing Conditioner, for a real treat. Clean, glossy shine...lovely. A great product. A rich clean feeling. Lathers easily and not heavy. Ideal for Tired dull, or distressed hair. "I have long, fine, coloured hair, which likes a little tlc. This shampoo provides it, along with the conditioner. My hair just looks really healthy..."